Joshua Akery, Tyler Whidby, and Brian Wrenn have filed a joint suit against D.C., supported by the Second Amendment Foundation (SAF), which backed the first lawsuit. The case is again being presided over by Judge Scullin of the U.S. District Court for the Northern District of New York, who also handled Palmer for the District Court for the District of Columbia due to a backlog. According to the plaintiffs, the issue at the heart of the case is the same as in Palmer. "The Second Amendment Foundation is committed to restoring firearms rights to all residents in Washington D.C.," said Alan Gottlieb, SAF’s founder. "As long as the city will not recognize the two SCOTUS Second Amendment decisions we will continue to file suits against their unconstitutional schemes." Akery, one of the plaintiffs, echoed Gottlieb’s sentiment. "D.C. officials thought they could deny fundamental rights by requiring us to demonstrate ‘a special need’ for a basic civil right recognized in every state," he said. "This suit requires D.C. officials to demonstrate their special need for ignoring the court’s July ruling and continuing to violate the Constitution." "Why should cronies and the wealthy be allowed to protect themselves and their family while the average citizen of this country is disarmed in one of the most dangerous cities in America?" Whidby, another plaintiff, said. Whidby is a Navy veteran and father of two who is expecting another child. He has worked as an engineer in the offshore oil business for the last eight years. He also owns a gun shop and consulting business. He lives with his family in Virginia but also spends time in Florida, where he owns some property and holds a concealed carry permit. Akery and Wrenn, the third plaintiff, live in D.C.
Akery lives in the Northwest section of the city and is currently working toward a PhD. He holds concealed carry permits in both Pennsylvania and Utah. He has also registered a firearm in D.C.
Wrenn is a software engineer who moved to the city in 2001 and has lived in Adams Morgan, Columbia Heights, and Edgewood. While he does have a firearm registered in the city, he is the only one of the three plaintiffs who currently holds no concealed carry permits. "Some people have asked me why don’t I just move to Virginia if I want the right to carry a gun," Wrenn said. "I answer by saying that no person should have to move to secure one’s right." The District of Columbia claims the three men have no "good reason" to fear injury or "special need" to carry a gun in the city. For their part, the plaintiffs are not claiming they should have been approved for permits under the current law. Instead, they say the current law violates their Second Amendment Rights. The city sent all three men similar rejection letters. "The applicant did not demonstrate a good reason to fear injury to person or property, or other proper reason for a concealed carry license," the letters from Metro Police Department Sergeant Colin Hall said. "Specifically, the applicant did not meet the minimum requirement of showing: ‘a special need for self protection distinguishable from the general community as supported by evidence of specific threats or previous attacks that demonstrate a special danger to the applicant’s life,’ and therefore did not receive further consideration." Since Whidby included the transportation of money in connection to his business and the protection of his children in his application, Sergeant Hall included an additional explanation in his denial. "The applicant did not meet the minimum requirement of showing: ‘Employment of a type that requires the handling of large amounts of cash or other highly valuable objects that must be transported upon the applicant’s person." "The applicant also wrote that he has two family members that are physically or mentally incapacitated, the applicant did not demonstrate that the referenced family member(s) had a ‘special need for self-protection distinguishable from the general community as supported by evidence of specific threats or previous attacks that demonstrate a special danger to the applicant’s life’ and therefore did not receive further consideration," the letter continued. As with the other plaintiffs, Whidby said he decided to join the suit to assert what he sees as his natural rights, not to argue over process. "My small children are unable to defend themselves should the need arise, particularly in high crime D.C., which per natural law leaves their father to protect them," Whidby said. "Unfortunately, again, D.C. prevents the assertion of these natural rights." The plaintiffs’ attorney, Alan Gura, reiterated this position in his preliminary injunction filing with the court. "This case can be resolved by recalling first principles," he said in the filing. "The concept of a ‘right’ is simply not compatible with Defendants’ licensing requirements for the act of carrying a handgun for self-defense." "A ‘right’ to do something only when the police determine one has a ‘good’ or ‘proper’ reason to do it, is not much of a right. People would scoff at ‘rights’ to due process, or against unreasonable searches and seizures, only when the police chief agrees that someone has an unusually ‘good’ or ‘proper’ reason to enjoy those rights." The plaintiffs disagree over what the outcome of the case ought to be. "I think trying to guess what judges are going to do is like trying to guess the Powerball number," Wrenn said, "but I think the city should have more of a ‘shall issue’ approach." Under a "shall issue" system, individuals need only pass a background check and complete a training course in order to receive a concealed carry permit. They are not required to demonstrate reasons. A "shall issue" system requires government officials to issue concealed carry permits to individuals who pass a background check and complete a training course; it does not require applicants to demonstrate their need to carry a firearm. Thirty-one states currently employ a ‘"shall issue" system for issuing permits. Akery also hopes to see such a system in D.C. However, Whidby prefers an approach known as "constitutional carry" under which anyone who can legally own a gun may legally carry one as well. "Constitutional carry" is in place in five states. "This would be an ultimate goal," Whidby said. In addition to the preliminary injunction, the plaintiffs filed a request to expedite the case in the hope of avoiding the five-year long wait they faced in Palmer. The judge has yet to respond. For now, there is nothing left for the plaintiffs to do but wait. "I never thought I’d be party to a lawsuit," Wrenn said. 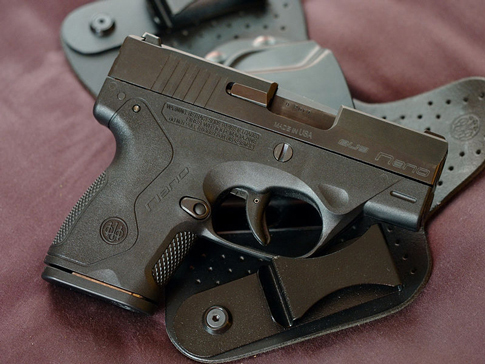 "When it came down to it I thought ‘I complain about this a lot and I have an opportunity to do something about it.’"
This entry was posted in Issues and tagged 2nd Amendment, Concealed Carry, Gun Control, Guns, New Gun Laws, Washington. Bookmark the permalink.